When I started my Pathfinder campaign, I wanted three things. 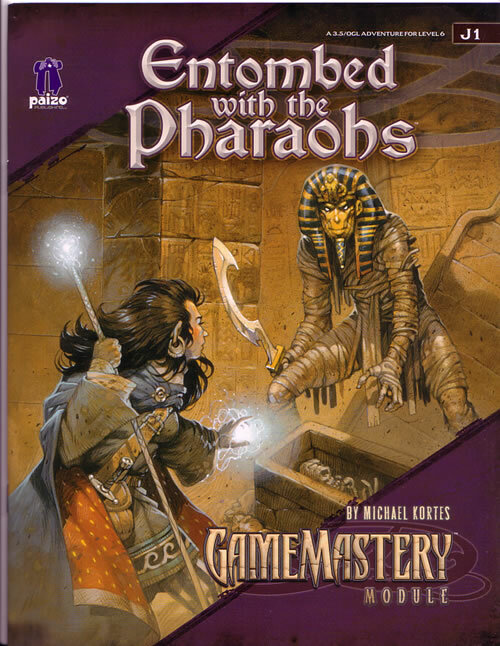 I wanted to involve a lot of undead, I wanted killer dungeons, and I wanted an Egyptian theme to the campaign. Luckily, the first two go hand in hand. And when I discovered that Pathfinder's default setting of Golarion has an Egyptian-analogue called Osirion, it was suddenly much easier to set up. My superobjective (an actor's thing) was that I wanted to have people in the house. A lot of middle-aged men suffer from loneliness and depression because they do not socialize enough. Having gamers in to laugh, kill things, and generally goof around forces me to be social once a week. I have noticed my depression has visited less often since I started the group. I fused together Pathfinder's Osirion and Green Ronin's fantastic Hamunaptra for background. I didn’t have the time to write my own adventures, but I have a lot of deathtrap dungeons already, and it was easy to fill in with other adventures that fit the theme. I think it worked reasonably well. The characters started out as prisoners, their sentences commuted by the Temple of Set in return for doing some dirty jobs. Their first assignment was to find out why the temple's bees weren’t producing honey. This properly set the campaign tone as not entirely serious. The first actual tomb-raiding. This is a fun low-level adventure with good background, several small tombs, and an entertaining plot. I hate to call this disappointing, but it’s a bit simple. I made this a more interesting adventure by allowing the adventurers to negotiate with the involved mummy. I bought this 1st edition adventure back when it first came out. I’ve carried it through many moves for more than thirty years, and finally got to run it. A wonderful adventure, a pseudoegyptian dungeon crawl set in a pyramid with a lot of creativity, plenty of strangeness, and a surprising amount of humor. The backstory provides a good hook that the players can figure out and interact with. A particularly good Pathfinder adventure, involving a certain amount of tomb-robbing, but with a twist. A combination of interesting characters, clever traps, and an enjoyable progression make this a great adventure. This was a side-quest that first touched on my own campaign arc. They are initially sent because a girl is kidnapped, and golly, there's grells, grimlocks, and more information about the past than they thought was going to be there. Maybe not the most inspired adventure. Still, a few puzzles, a little combat. The players didn’t seem to mind. 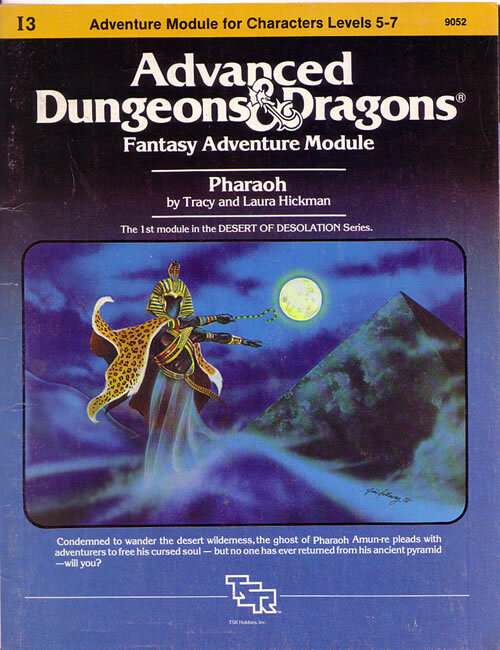 One of the adventures that made me realize that a 3rd edition Egyptian-style campaign was possible. A fine adventure in a pyramid with mummies and all the Egyptian trappings I could want. Also the introduction to the mystery of Aucturn. 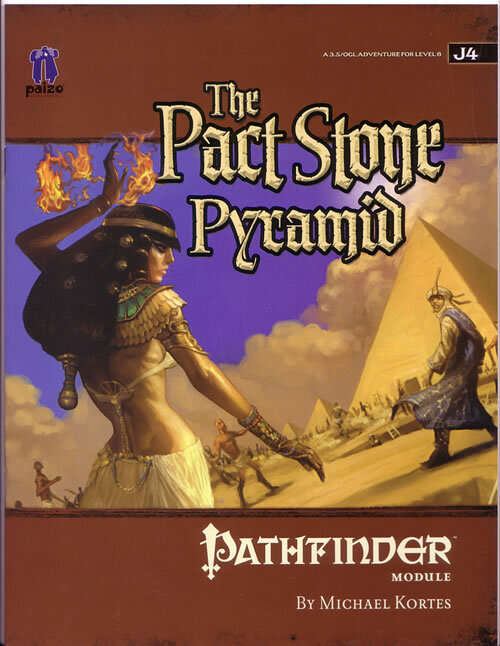 Following on from the previous pyramid adventure, this was another pyramid dungeon crawl, and had its own contribution to the mystery of Aucturn. I provided my own answer to the mystery, and just about the time we were playing this, Paizo came out with their own. I liked mine better. Nevertheless, this was another fun pyramid adventure from the people at Paizo. A city-based intrigue adventure from Paizo. It made for a nice change of pace, giving the characters a chance to do some negotiation, and run through the streets of the city. A smaller adventure than J1 and J3 above. Still, this was a good, rich adventure with interesting tomb traps, undead to destroy, and links to the future of the campaign. This was the adventure where the whole plot basically came out. And the characters learned that leaving the alchemist alone in front of the undead antipaladin was a mistake. Here the players found out about the Dynasty of Jackals, a line of corrupt and demon-consulting pharaohs whose names had been eliminated from official history. They discovered the mummified remains of the majority of the line, but not the ultimate resting place of the Dark Undying One, the last and most terrible of the Dynasty of Jackals. He was so evil that merely speaking his name would bring damage upon the utterer. Acererak was the court wizard of the Dark Undying One. The mechanics of Pathfinder mean that the adventure cannot be as deadly as it was originally intended to be. Still, the three pit traps puzzle is something you can't roll dice for, and it got the players, both here and in Necropolis. Good fun. This signaled the beginning of the serious trapped tombs adventures: the next three tombs were tributes to this classic. Srihoz was the chief of the Navy under the Dark Undying One. This turned out to be more deadly than the infamous meat-grinder Tomb of Horrors. 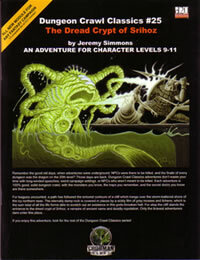 While the Tomb was first, the designers of the Dread Crypt also had some very dirty tricks to lay on the characters. The tomb of the Dark Undying One’s mightiest general. 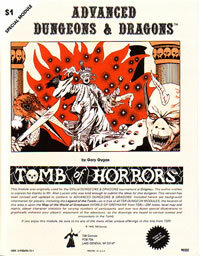 Wonderful tribute to the Tomb of Horrors. But another instance where the extensive magics involved would have been much more expensive than a resurrection spell. But shush, because this one is really good, even though I ignored the wilderness adventure getting there. The individual entombed here was the tomb architect of the Dark Undying One’s court. And had directions to the tomb of Mrs. Dark Undying One. 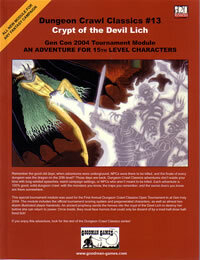 An update of a great 2nd edition adventure, also from Dragon magazine. 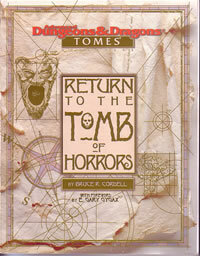 A sly, thoughtful tribute to Tomb of Horrors, which fit easily with the campaign’s theme of tombs and deadly traps. An interruption of the main quest with a delightfully insane premise. The hook is "a full-sized pyramid on rollers is going to squash Pharaoh's favorite oasis. You will do something about this immediately." StarHaunt was a bit of an emergency insertion. I'd made The Rolling Tomb too difficult. But replacing the meteor with an undead god-fetus made this adventure wonderfully macabre. Seriously. Look up "atropal scion" and tell me that isn't creepy. After a couple of less trappy-deathy adventures, this was back to the meat grinders I love. Lots of traps, and traps within traps. There was a wonderful moment with the hellwasp swarms when everyone was helpless except the Fire Oracle. Who cashed in his chips later this adventure. 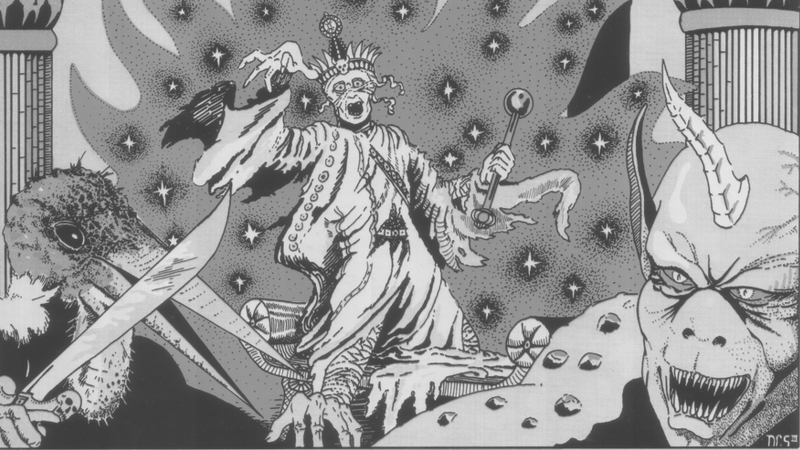 Sort of Gygax's adventure to top Tomb of Horrors, this is as gonzo and weird as you might expect. Wonderful, and one of the adventures the campaign was constructed to lead up to. Well converted by the people at Necromancer Games, and delightful fun for the players. They destroyed the Dark Undyng One, and the beacon that was drawing Aucturn close, amplifying necromantic spell effects. But that wasn’t the end of it all. Turns out the court wizard, Acererak also had a few lingering threats to the well-being of the world. The players learned that Acererak wasn’t quite as destroyed as they thought he’d been. And he’s mucking about with something in the Negative Energy Plane. Good adventure, and the beginning of the campaign’s endgame. I didn't use the introductory adventure, but the rest was pretty darn entertaining, if a little weird to convert to Pathfnder. Still, this is a solid, puzzling sprawl of a mega-adventure, and I’m quite happy that I finally got to run it. This was the third and final Acererak the party faced. I’m a little sad I wasn’t able to reconcile the initial parts of the adventure with my campaign, instead only using the final adventure. Still, I liked this. Unfortunately, the party acted with a little haste before they learned what was going on, and managed to doom themselves. Ah well, such is giving control of the story over to the players. And there’s a lot of potential to having a new Devouring God. There are a few adventures I wanted to run but couldn't find a way to slip in. Grimtooth's Dungeons of Death, Mayfair's Undead, and the Tomb of Iuchiban from Alderac. But they either didn’t fit the structure of the campaign, or mechanically would have lost too much when converted to Pathfinder. But now we’re onto a new campaign, one starting with zero level characters with random backgrounds and straight 3d6 characteristics. Let’s hope might oaks from small acorns grow. I want to thank everyone who was part of the campaign, and made it the successful fun it was. Chris, John, Tristan, John, Diane, Shannon, Tara, Alex, Dave, and Nick: thank you all very much. I hope you had as much fun as I did.